England piled up 267 runs in 90 overs with seven wickets in hand vs. South Africa at the end of the first day of the first Test. 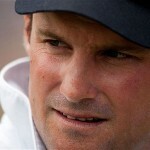 The first Test of the three match series commenced on Thursday, July 19, 2012, at Kennington Oval, London. Earlier, the captain of England, Andrew Strauss, won the toss, elected to bat first and came in to open the innings with Alastair Cook. The home team faced an early blow when Strauss was declared leg before wicket off Morne Morkal without opening his account on the fourth ball of the first over. 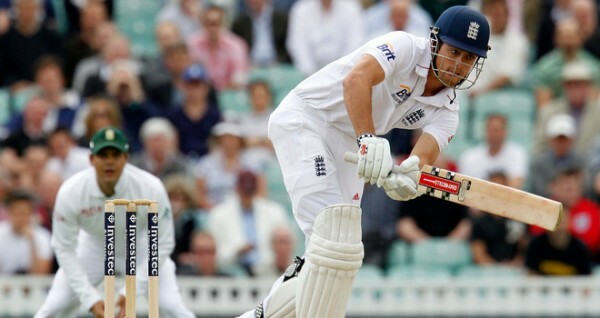 Jonathan Trott came in next and initiated his innings with a four and Cook took off with three runs. The innings was stabilised by the two batsmen, they added few boundaries in between and the first fifty of the innings was completed in the 16th over. Cook hit the first six of the innings in the 21st over and the score reached 69 at lunch without losing any further wicket. Alastair Cook geared up in the 29th over with a couple of fours, attained his fifty in the 31st over and the first hundred for the team also appeared on the board in the same over. Graeme Smith used six bowlers to dislodge the partnership but remained unsuccessful as the batsmen did not offer any chance. Jonathan Trott got his fifty in the 45th over and started playing his strokes later on in the innings by sending the ball out of the fence at regular intervals. The total reached 158 after losing one wicket in 53 overs at tea, Alastair Cook was at the crease with 69 and Trott was at the other end for 68 runs. England lost their second wicket at 170 when Jonathan Trott was caught behind by the wicketkeeper AB de Villiers off Morkel for 71 scored off 162 balls with 9 fours. Kevin Pietersen joined in next with Cook and took a slow start by scoring three runs on the first 20 balls he faced. He got his first four in the 64th over as Cook carried on accumulating the useful runs from the other end. Alastair Cook thrashed his 20th Test ton on the fourth ball of the 71st over with a single and was applauded by a large crowd present in the stadium besides his team mates in the dressing room. Pietersen enhanced his scoring rate with the assistance of few boundaries and added 81 runs partnership for the third wicket. 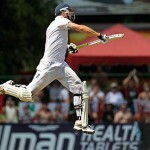 Jacques Kallis provided the much needed breakthrough when Kevin Pietersen was caught behind by de Villiers for 42 runs. The third wicket fell at 251 runs as the run machine of England, Ian Bell, came in the centre and got two fours in the 85th over. Both batsmen were watchful in the dying moments of the day as England hammered 267 runs for the loss of just three wickets at the end of the 90th over. Alastair Cook remained unbeaten for 114 off 283 deliveries with 1 six and 11 fours whereas Ian Bell secured his end for 10 runs. England is in total command of the game and would like to achieve a mammoth total on the second day whereas South Africa will try hard to get couple of early wickets in the first hour to get back in the game.